In June of this year, two Korean actors will be feted at the famed Grauman’s Chinese theatre on Hollywood Blvd., where they will have their hand and footprints cast in the pavement; the first Asian performers to be honoured in such a way. One is Lee Byung-hyun who, rather than being one of the nation’s best or most long-standing thespians, is the one with the highest international profile. He is making a name for himself in the US industry and will soon be seen in G.I. Joe 2 and then the sequel to Red (2011). In fact, the former will be opening mere days following the aforementioned ceremony so his selection does smack of opportunism. However, the second star has all the hallmarks of greatness that such a distinction would indicate, and then some. Ahn Sung-ki is a legend in the Korean film industry and is probably its most respected star. One of his earliest roles was in Kim Ki-young’s The Housemaid (1960) and he starred in a series of classics starting in the 1980s, such as A Fine, Windy Day (1980), Im Kwon-taek’s Mandala (1981), Whale Hunting (1984), Park Kwang-su’s Chilsu and Mansu (1988), The Taebaeck Mountains (1994, also Im Kwon-taek), Lee Myeong-se’s Nowhere to Hide (1999) and many, many more. Even now he is still one of the country’s top working actors and earlier this year he proved that he could still draw in the crowds just as well as anybody. He has won the Grand Bell Award (the Korean Oscar equivalent) no less than six times but he seems almost certain to pick up his seventh accolade later this year for his latest performance. Following its release earlier this year during the lunar day holiday, Unbowed met with much the same reaction as last year’s Silenced. They were both incendiary courtroom dramas based on real events that became big commercial and critical hits while also serving to open up long overdue national dialogues about Korea’s justice system and its rampant cronyism. 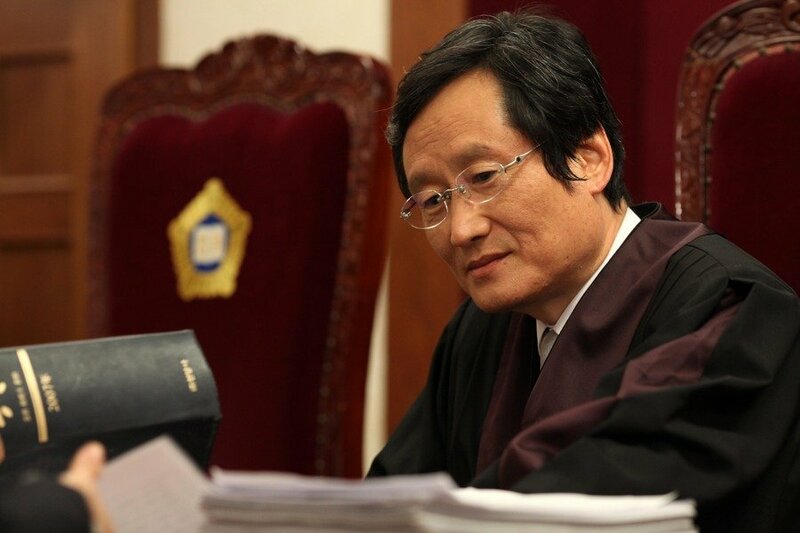 In fact, in the space of just a few months there were three high profile Korean courtroom dramas that connected with audiences, the other being The Client (2011), itself a strong feature which also alluded to problems in the country’s legal system but was mostly a generic (and fictional) piece. Kim Kyeung-ho (Ahn Sung-ki), a university mathematics professor, was ousted from his position in the mid-90s for insisting that an incorrect question on the institution’s entrance exam be removed. Following protracted and ultimately fruitless trials and appeals he found himself, in 2007, aiming a crossbow at a judge outside his home. Unbowed chronicles the court case that followed and highlights the broken legal system in Korea through this true story. Chung Ji-young is most well know for making a few war films in the early 1990s, such as The South Korea Army (1990) and White Badge (1992), and Unbowed is his first feature in 14 years. The industry has changed a great deal during his absence yet his film is vivid and burns with urgency. Chung keeps things relatively simple from a mise-en-scène standpoint yet his unobtrusive and effective style leaves the film in the hands of its strongest elements: the excellent cast and brilliant script. Ahn Sung-ki is perfect for this role, there’s really no other word for it. He is absolutely convincing as a fiercely intelligent and pragmatic man driven to the edge and his standoffs with the cold judge (Moon Sung-kun, equally formidable) are intense and cathartic. Though Ahn has done some great work in the last 15 years, this turn his reminiscent of his powerful roles in the socially conscious films of the ‘Korean New Wave’ from the 80s and early 90s. He spends almost the whole film handcuffed and sitting down yet he is magnetic, his performance is, just like his character, passionate and galvanised. The film’s plot is naturally dialogue-heavy and requires a lot of context but the script manages to succinctly bind the many pieces together into a seamless 100-minute narrative. The complex legal machinations of Professor Kim’s legal debacles are relayed in a remarkably clear fashion without ever being toned down. The film’s pacing is fast but it never feels rushed yet it is the dialogue is the scenario’s greatest asset. Like all of the best courtroom dramas, such as Otto Preminger’s Anatomy of a Murder (1959) and Stanley Kramer’s Judgment at Nuremberg (1961), Unbowed is the kind of successful rendering of a dense and complicated subject that makes you feel a little smarter after having seen it. Korean viewers connected with the film in a big way earlier this year and a lot of that had to do with its depiction of current social ills, which are in desperate need of redress. But in the end the success of Unbowed is entirely of its own making; it is an invigorating and electrifying work and there hasn’t been a better legal thriller in years.